Abandoned Vehicle? 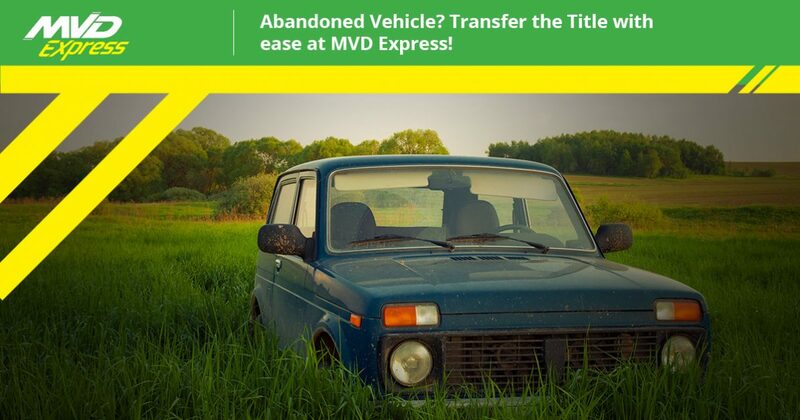 Transfer the Title with ease at MVD Express! If you have a car or other type of vehicle that’s been abandoned on your property for a long period of time, we understand your frustration. Not only is it an eyesore, but an abandoned vehicle can also attract vandals or be used for drug drops, amongst other things. Abandoned vehicles are a serious issue and we can help! Our friendly customer service agents at MVD Express are ready to assist you with transferring the title into your name so you can sell or dispose of the vehicle. By New Mexico state law, an abandoned vehicle is any type of motorized transportation that has been left on private or public property for an extended amount of time. After 30 days, a private property owner is allowed to file for an abandoned vehicle lien with any MVD office. How do I File a Lien to Transfer the Title? Obtain an NCIC Clearance from the State Police affirming that the vehicle is not stolen. You must fill out a Notice of Lien (Form 10058) and send it to the vehicle’s owner(s), lien holder(s), and any other party involved by certified mail. You must maintain a copy of notices mailed and certified mail receipts. After receiving a Notice of Lien, the registered owner, lienholder, or other involved party has 10 days to pay the accrued debt or recover the vehicle. If the vehicle is not recovered or the debt is not paid within 10 days of notification, you (the lien claimant) must advertise a public auction for the sale of the vehicle. The date for the public auction of an abandoned vehicle varies depending on if the vehicle is registered in New Mexico, registered in another state, or unregistered. There are also specific advertising standards you must meet. Keep copies of all advertisements placed. After the public auction of the abandoned vehicle, you must complete an Affidavit of Resale (Form 10059) to summarize and provide documentation for the entire process. If you were able to sell the vehicle at auction, you must complete and submit this form with the purchaser’s name. If you were unable to sell the vehicle at auction, you must indicate this on the Affidavit of Resale. You are then eligible to apply for the title and may register the vehicle. You must have the vehicle titled in your name within 30 days of the public auction if you wish to sell the vehicle without penalty. Transferring the title of an abandoned vehicle is a time-consuming process that must be followed to the letter. At MVD Express, we understand that this can be a bit intimidating and we are here to help in any way that we can. If you need to transfer the title of an abandoned vehicle, stop by one of our 10 locations and we’ll gladly answer your questions, provide you with the necessary forms, and give you the information you need to successfully re-title an abandoned vehicle. Stop into any of our locations today or call 505-226-9333 to get the process started!